This collection by Max and Me soothes the senses and leaves your skin and body feeling high vibration energy. Begin your ritual with The Intuitive, a cleansing, grounding and skin soothing floral mist of palo santo, yarrow and fragonia. Next, lend a softened and cleansed feel to skin with Sweet Serenity mask and wash, a rare blend of raw manuka honey, dhatlelo cherry, mangosteen, and cacao, scented with notes of gardenia, neroli, sandalwood, patchouli, geranium bourbon and rose. Finally, wrap yourself in a Circle of Protection, a precious blend of moisturizing beauty oils (argan, marula, rosehip) that impart a protective quality to skin and aura. This collection is a value, saving you $18 when purchasing each item separately. • The Intuitive: Mist onto clean skin prior to applying serum or facial oil or to set makeup for a feeling of hydration and clarity. May also be used as a daily toner to support the appearance of clear, healthy and vibrant skin. Mist onto the body for a feeling of calm and centeredness and to clear energy and raise the vibration of your space. Mist on your pillow to support ease of falling asleep and a good night's rest. • Sweet Serenity Mask & Washl: As a mask: When you need a feeling of extra soothing, loving care for thirsty skin, take a little bit of this deliciousness and gently mix it with water until you have a smooth, creamy texture, hues lighter than the original color. Then apply it to your skin. Use it on the full face and neck, to lend a cooling feel, relieve feelings of irritation, and improve the appearance of skin tone for a naturally glowing look. Let it remain on skin for up to 30 minutes or longer, then take it off with a moist cloth. As a wash: If you have long craved for beautifully calm, bright and dewy looking skin, here is how to get it: take a little bit of this deliciousness and gently mix it with water until you have a smooth, creamy texture, hues lighter than the original color. Then apply it to your skin. Use it on the full face and neck, to lend a cooling feel, relieve feelings of irritation, and improve the appearance of skin tone for a bright, beautiful look. Softly circle with your fingers for an ever so gentle peeling or take it instantly off with a moist cloth. 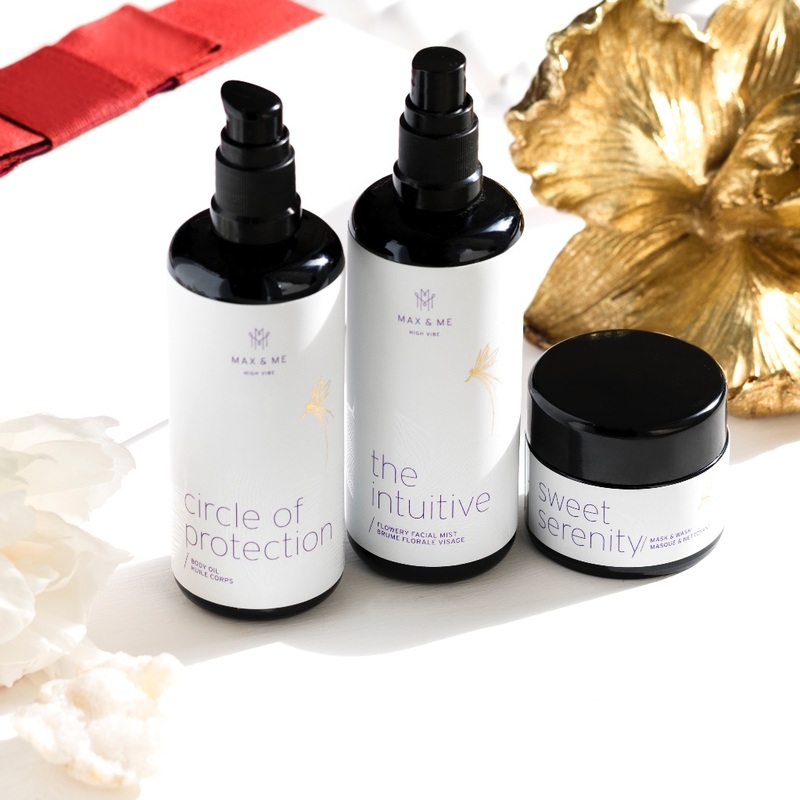 • Circle of Protection: When your skin and soul need some tender loving care, warm a few drops of this heavenly oil blend in your palms and inhale deeply. Close your eyes, let go of all your thoughts and feel a connection with the very special energy. Then massage the body oil blend onto the moist skin. Take your time, take your space to savour the sweetness of it all, the sense of immersion into light, a vibe of good energy, feelings of beautiful vibrations, the way you feel, the way you glow. These are moments of bliss. The Intuitive: Achillea Millefolium (Yarrow) Flower Water*, Bursera Graveolens (Palo Santo) Flower Water**, Citrus Aurantium (Neroli) Flower Water*, Myrtus Communis (Myrtle) Flower Water*, Hamamelis Virgiania (Witch Hazel) Flower Water*, Rosa Damascena Flower (Rose) Water*, Calendula Officinalis Flower (Calendula) Extract*, Olea Europaea (Olive) Fruit Oil*, Lactobacillus Ferment, Rosa Canina (Rosehip) Fruit Oil*, Sclerocarya Birrea Kernel (Marula) Oil**, Bursera Graveolens (Palo Santo) Oil**, Citrus Aurantium Flower (Neroli) Extract* Hyssopus Officinalis Decumbens Hyssop)*** , Citrus Reticulata (Green Mandarin) Flower Extract*, Styrax Tonkinensis (Siam Benzoin) Oil*, Helichrysum Italicum (Immortelle) Flower Oil*, Agonis Fragrans (Agonis) Oil** , Tanacetum Anuum (Blue Tansy) Oil***.